One of the good things about being in a book club, whether it be face to face or online (or both as the case is for me), is that you are encouraged to read books that you otherwise just wouldn't read. Whilst that doesn't always work out because there was a good reason that you wouldn't normally read that book, some times it brings you a lovely gem of a book! 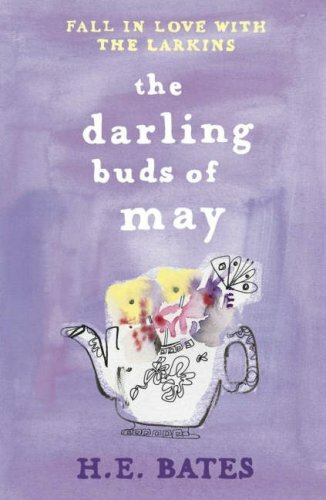 This month my Facebook book club chose to read The Darling Buds of May by H E Bates, and this was one such gem. The central characters are the Larkin family - Pop, Ma, Mariette, Zinnia, Petunia, Primrose, Victoria and Montgomery. In many ways Pop and Ma especially, and Mariette (to a degree) are larger than life characters. Pop is a bit of a wheeler dealer. Without having a job as such he manages to talk his way into all sorts of deals including a Rolls Royce, freezers and more. There always seems to be plenty of ready cash! He describes himself as a farmer, but there wasn't much evidence of that in the book really. The vagueness of his income sources are something that concerns the tax man too. He hasn't lodged his tax return (not for the first time I suspect) and so they send a young civil servant, Cedric Charlton, down the farm to give him the necessary forms and to assist him in completing them. The whole family are just returning from a trip to get ice creams and fish and chips when the eldest daughter, Mariette spots Mr Charlton (soon to be known as Charley by all concerned) in the farmyard. Despite his best efforts to do his job, Charley soon finds himself sitting down to eat with the family. Every time Charley mentions the tax forms, he is subsequently distracted by food, by drink, or more increasingly, the attentions of the lovely Mariette! Poor Charley never stood a chance! Charley's stay extends over the weekend, and then even longer as he finds himself more enmeshed in the life and seduced by the lifestyle of the Larkin family. I do remember watching parts of the TV series that was made in the 80s which starred David Jason and a young Catherine Zeta-Jones. Even with that, I was a little surprised by how much I enjoyed reading this book. It is only short, around 130 pages, but it was such a sensual treat and it was much more relaxed about life than I expected that it really would have been during the time that it was set - the late 1950s. One thing that I really did enjoy was watching the first episode of the TV series after finishing the book. It really stuck quite closely to the story in this book, which was a pleasant surprised. If you are interested, you can see the first part of the first episode here. 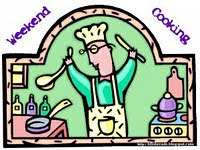 Now I haven't forgotten that I am posting this as a Weekend Cooking post. I promise you it really does fit. I mentioned a couple of paragraphs ago that this was a very sensual book, and I mean that in many senses of the word. There is quite overt sexuality, not only between Mariette and Charley (although nothing explicit, all implied) but also lots of nudge, nudge, wink, wink stuff going on throughout the book. Really though, the senses are titillated by all the descriptions - everything is described in ways that made you want to be there. From the freshness of the strawberries as they are being picked under the hot summer sky (not to mention the fight in the strawberry fields between two women), to the smell of the hay being cut so that the big field can be used to host a gymkhana unlike any the village has seen before. Even the language used is evocative in showing the differences between the Larkins and those around them! Food, and alcohol, is present in every aspect of the story. The aforementioned strawberries, fish and chips, and ice cream are just the beginning. There is fresh pineapple covered in cream, and discussions about whether there should be two geese cooked for Sunday lunch or three (something that make Charley just a little uncomfortable given that his legs had come into contact with said geese earlier in the day), whether Ma should cook up some hams to feed the guest at the gymkhana and so much more, always in huge amounts! Also prevalent throughout the story - alcohol and lots of it! From cocktails that I am pretty sure would blow my socks off, alcohol was present at the dinner table, after dinner, before dinner, at the gymkhana, everywhere! The interesting thing about all this abundance of food and alcohol is thinking about the world that this book would have been released into. It was initially published in 1958 in the UK. Rationing had only stopped in the UK in 1955, so it would still have been a time when not everything, like pineapples and bananas, would have been easily available for the everyman on the streets. More than once, I found myself wondering about whether there was a propaganda like feeling to the book, or maybe it was just meant to be an antidote for those readers who had been going without for so long! Either way, even when it is easy for us to go to a supermarket and pick up items that would have been incredibly exotic to those people, I was still left savouring the descriptions and even just the abundance that was demonstrated within the pages of the book. This is the first book in a series featuring the exuberant Larkins! I definitely plan on reading more. If you are looking for a short, fun read, full of humour and charm, then this might be, to quote Pop Larkin, perfick! Mr Charlton is visiting to find out why junk-dealer Pop hasn't paid his tax - but nothing's that simple at the Larkins'. Mariette takes a shine to 'Charley' - as Pop calls him - and before long the family have introduced the uncomplaining inspector to the delights of country living: the lusty scents of wild flowers, the pleasures of a bottle of Dragon's Blood, cold cream dribbled over a bowl of strawberries and hot, hot summer nights. In fact, soon Charley can't see any reason to return to the office at all. I have never heard of this book and now I want to read it. I love that you reminded us to put it in context. Can you imagine what the abundance of food and drink must have seemed like to people just off rationing? Indulgent in every sense of the word. I'm going to add this book to my wish list and check out the video too. did someone say we were having cocktails?! This sounds like a good read :) I have to add it to my wishlist. Thanks! I often think I need to do a post on Comfort Books (like comfort food). For my mom they are the out of print 'Suds in Your Eye' series and for me the Mitford books by Jan Karon. This sounds like a comfort everything-will-be-ok kind of book to add to my list! Btw I have a summery cocktail recipe in today's post! Adding this one to my list as well, sounds like a very enjoyable read. I'd loved to have seen the TV series. I've never heard of this series either. Finding gems like this is the reason I enjoy my book club, too! I enjoyed your review and it sounds like an interesting read. I will look for it. At least reading about food is no calories at least until I get ravenous, then game's over. A book club on Facebook? Sounds like fun. Thanks for sharing I now have this series in my netflix que! I LOVE this book - the setting, the characters, the story. We saw the show on tv years ago, but a while ago, we rented all the dvds from Netflix and watched the whole wonderful series. Pa's 'bar' is particularly appealing with those lights. This does sound so lovely and comforting with a good story and characters to boot. HE Bates was one of England's most prolific authors and it's so sad that his works aren't more widely known. As well as the Larkin stories there are many other novels and short story collections to choose from. My particular favourites are The Sleepless Moon and Love For Lydia or short story collection, The Four Beauties. If you have fond memories of the Darling Buds Of May, Bates also wrote the My Uncle Silas stories which were also adapted to TV in the 90s. The Larkins sound like a fun family to visit with. Thanks.